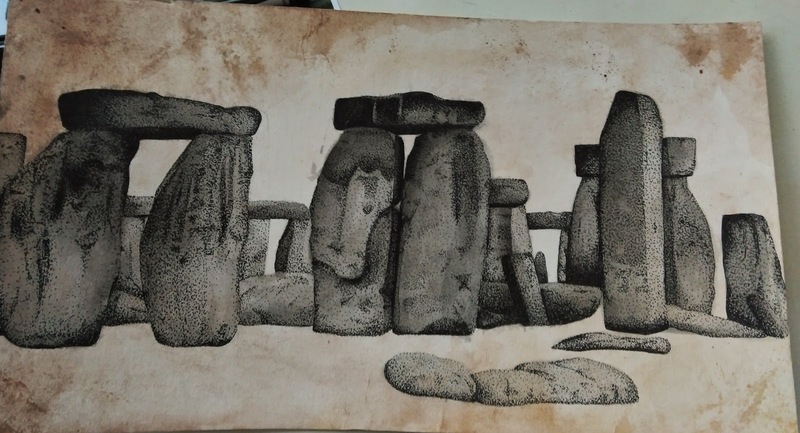 For my landscape project, I chose to do the Stonehenge in ink. I had never used India ink before so I knew I wanted to use that so that I could learn to work with a new medium. Working with watercolor on a previous project had been good practice because the ink was very similar only much darker. I decided to do a light wash of brown watercolor with splatters and splotches for the background. I then did a light layer of the india ink for the stones. I stippled with black ink pens overtop to darken up my values and to enhance my details. When I was done with the inks, I went back in with the brown watercolor to put in some faint shadows under the stones to make them more 3 dimensional which really helped make the piece look more complete. While this project took me a while to complete since stippling is slow-going, I am really happy with the completed project.